Scott Holland of Manaunk, Philadelphia made a promise to walk his daughter down the aisle for her wedding. In his youth, Mr. Holland was an avid runner and cyclist, but when his daughter was age two, he was diagnosed with multiple sclerosis. His mobility declined and by the time the wedding arrived, he hadn’t walked in over 20 years. To the surprise of the 200 guests, Mr. Holland kept his promise by donning an exoskeleton over his suit and walked the teary-eyed bride down the aisle. Mr. Holland wasn’t going to allow MS to prevent him from doing what he wants and managed this amazing feat through stubborn determination and four months of physical therapy. MS is a destructive autoimmune disease that affects both the brain and spinal cord. Scientists are unsure what triggers MS, but the result is the body’s own immune system will begin to attack the myelin sheaths of neurons. Our neurons relay information electrochemically, but a naked neuron cannot produce an action potential to signal the next neuron. To propagate the signal from neuron-to-neuron, the dendritic arms of the cell are wrapped in a biologic insulator, myelin. Typical symptoms of MS include fatigue, blindness, numbness, tremors, altered sensations, difficulty walking and eventual paralysis. Though MS can be treated symptomatically, there is no cure for the disease. Importantly though, early detection can slow the disease for the 2.3 million people afflicted with MS worldwide. Individuals with progressive MS often need ambulatory assistance such as canes, walkers, and wheelchairs. Advances in science and technology have allowed for the development of a variety of applications for MS patients assistance, including exoskeletons. Who doesn’t want a robot suit? As science fiction becomes reality, wearable exoskeletons are beginning to emerge as a viable healthcare tool. Though only a handful of studies are available, the overall outlook is good. A group led by the University of Texas, Health Science Center (UT Health) in Houston examined the feasibility benefits of exoskeleton-assisted walking. With support from the National Multiple Sclerosis Society, the team tried to scientifically quantify the benefits of utilizing exoskeletons beyond anecdotal evidence. The team enlisted a 33-year-old MS patient and monitored her oxygen consumption and heart rate during a six-minute walk distance test. The team reported that the subject showed significant decreases in both values when assisted with an exoskeleton. The team also monitored muscle activation of the lower extremities and the patient exhibited less muscle activity whilst wearing the exoskeleton. What this means as a whole is that the patient, while in the exoskeleton, was exerting less energy to perform the same activity without the suit. The decrease in metabolic expenditures also allows the patient to perform actions longer. Overall, the investigators show that the exoskeleton does provide an improved quality of life, as well as hard data to support exoskeleton use in rehabilitation. Currently, the UT Health is expanding and evaluating exoskeletons in clinical trials. As this is an emerging area of research, there is currently only one FDA-cleared exoskeleton system in the United States. ReWalk is currently in its sixth generation of a personal exoskeleton, designed for the lower limbs. It is designed to help patients stand, walk, and turn. 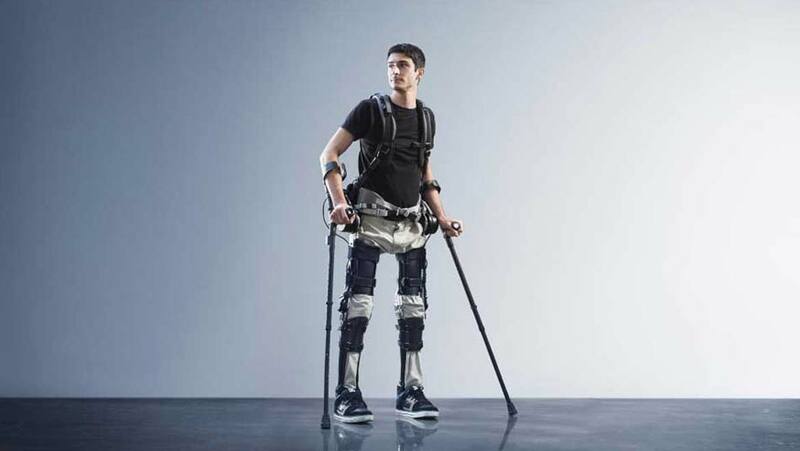 The suit even senses changes in the wearer’s center of gravity and will adjust the patient to maintain a natural gait. The newer soft-suit is designed to replace the rigid system used for spinal cord injuries. The new suit connects cables to wearable pieces of fabric attached to the lower limbs. The technologies discussed here have the potential to extend beyond MS. The robotics could be applied to patients with severe nerve damage from caused by spinal cord injuries or even strokes. Also, some patients with MS experience difficulties breathing as the nerves that control the respiratory system begin to fail. Deaths are often cited as ‘complications due to MS’ rather than from MS directly. Like the pulmonary complications above, MS patients often succumb to severe infections (sepsis), aspiration pneumonia, and sadly, suicide. Suicide rates for MS patients are higher than average, because depression and chronic illness can have a big impact on patients. What the exoskeletons provide are more than just mobility: they demonstrate an improved quality of life, which can potentially reduce suicide rates.